Potatoes are the most common and most consumed vegetable in every house. If you have no idea about what to cook for the day, the only savior is Potato (Aloo). Potatoes can be cooked in various different manners and if cooked properly they indeed satisfy the taste buds and increase our appetite twice. In India Potatoes are cooked in various different ways. In North India, Dum Aloo is really very famous and is deliciously awesome. In south India, Hyderabadi Dum Aloo is the real attention seeker. 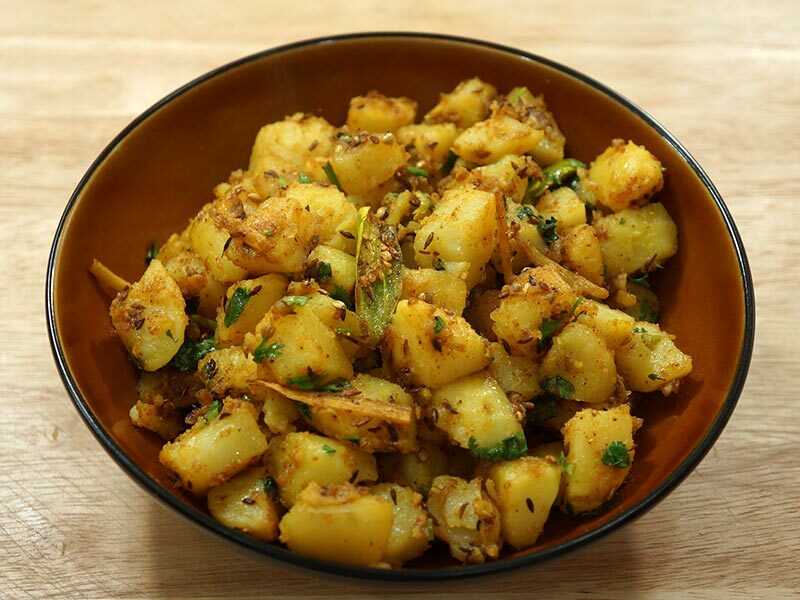 Here we are listing 5 Potato dishes which must be learned by every Indian girl. This is one of the most delicious north Indian dishes which are totally unable to increase your appetite with its delicious smell. This dish is prepared using baby potatoes. They are boiled and peeled and deep fried into hot oil. Then fried onions, tomatoes and few cashew nuts are grinded into thick paste which is added to the potatoes. Salt, turmeric, coriander powder, red chili powder and garam masala are added to the mixture and again cooked for 5 minutes by adding some water to the mixture; it is again cooked for 10 minutes. It is then garnished with finely chopped coriander leaves. This is a very famous dish from Uttar Pradesh which is cooked in Yogurt. This tastes really good with hot chapattis and paranthas. You can also have this with Pooris. Kastoori methi along with panchforan and finely chopped green chili are added to two teaspoons of hot oil in the cooking pan. Then one spoonful of gram flour (besan) is added to the pan. Now yogurt is added to the pan and mixed well. The boiled potatoes are then mashed with light hands into big pieces and are added to the mixture. A cup of water is then added and is left for 5 minutes to simmer. The dish is then garnished with finely chopped green coriander leaves. Kashmiri Dum Aloo is one of the royal foods in India which is really very delicious and posses the finger-licking taste if cooked properly. This dish tastes best with Naan, paranthas or chapattis. In this, baby potatoes are half boiled and then pricked with a tooth pick and are deep fried in hot oil. The gravy consists of Cashew, almonds, poppy seeds, cucumber seeds, fried onion, garlic, ginger and tomatoes. The gravy is very rich in vitamins and thus makes the dish a royal one. The deep fried potatoes are cooked in the thick paste prepared with the ingredients I already mentioned. Yogurt can also be added to this in order to increase the richness. Salt, turmeric, coriander powder, garam masala are added to increase the flavor. The dish is then garnished with finely chopped green coriander leaves. You must have heard about the Hyderabadi chicken Biryani and if you are a vegan then you have already missed the real taste of Hyderabad. But wait, you can still have that real Hyderabadi taste if you know how to cook Hyderabadi Dum Aloo Biryani. This is cooked with lot of ingredients and is highly time taking dish but if you really want to taste the Hyderabadi taste then you must know to cook this enormously delicious Vegetarian Hyderabadi Dish. Baby potatoes are peeled and pricked with fork and deep fried for 3 minutes in hot oil then marinated with yogurt mixed with turmeric, salt and garam masala powder. Meanwhile, you need to cook the rice, but it must not be fully cooked. The rice should be half cooked. After this you need to add cumin, cassia (tej patta), Cinnamon, black cardamom, green cardamom, black pepper into the hot oil. 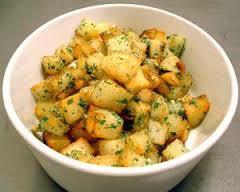 Let them temper and add the marinated potatoes into this cook them for 3 minutes and bring the flame to the lowest. Make a layer of dried onions over it and then the half cooked rice and then finely chopped green coriander leaves and mint. Add one cup water to this. Now cover this totally with a heavy lead and seal the lid with the dough and let it cook for 35 minutes. Now you can uncover the lid and few drops of red food color to add the delicious look to the Biryani. Last but not the least; Aloo Parantha is the lifeline of North Indian people. This is very easy to make and consumes less time. You can have the immense flavor of these Paranthas with green chutney, Mango pickle or tomato ketchup. You can cook this with mashed potatoes mixed with finely chopped onions, green coriander leaves, salt, red chili powder and finely chopped green chili. You fill the dough with this mixture, close and round it to make a chapatti and cook it like a normal Parantha. You are ready to serve this with anything you and your family wants to have with. These are some of the best potato dishes that can be cooked easily by you. The Dum Aloo recipes can surely win your heart and fill your appetite.